In 1969, Elisabeth Kübler released a book called "On Death and Dying" that described the Kübler-Ross model of five discrete stages by which people deal with grief. The stages are have since been expanded to seven and include: Shock and Disbelief, Denial, Anger, Bargaining, Guilt, Depression, and Acceptance and Hope. They are not only applicable to individual grief, but to groups as a whole. We can see a living example of this right now in the Republican Party. At first they were Shocked by the Democrats ability to stay competitive in the 2008 presidential race. Disbelief raised its head when the market slumped. Shortly there after Denial set in and they couldn’t believe that there was a chance that they may actually lose power. We are now at the stage of Anger. The far right, neoconservative side of the Republican Party is about to be put to bed and they refuse to go quietly. Like a child who is doing everything that they can to stay up, they’ve resorted to name calling, tantrum, lies, and threats all to hold on just a little longer. For the moderate conservative side of the party, the side that has been ignored in lieu of Christian Fundamentalist, big government through an ever ballooning military, and strong authoritarian leanings by a select group of powerful individuals, this is their opportunity to reclaim their party. And this is where Bargaining comes in. They can keep their party strong as long as they talk to the old neoconservative mouth pieces, that are currently stuck in anger and daily trotting out how the other side is represented by the antichrist or how the left getting power is a sign of some apocalyptic communist doom, and make them feel Guilt for taking your party down that path, losing their conservative ways, and selling-out to shameful neoconservative ideals. This reality check will indeed send some of them into Depression. Losing power is hard, especially when it was unchecked for so long. Undoubtedly some will not let go of the depression or guilt and revert to anger once again. Ostracize these people for holding your party back. Recovering your party is not too far off, but you will need the corporation of everyone to reach a general Acceptance. With luck, you can rebuild the Republican Party on a conservative platform that is not controlled by religious special-interests or neoconservative ideologues. And as a liberal, I welcome them back. Our country works best on balance. The liberal side needs the conservative side so that the country does not pendulum too far to the left. Our strength comes from the wobble between the two sides of moderate. It is with that moderation and balance in mind that we can all Hope for a better tomorrow. Calorie for calorie, junk foods not only cost less than fruits and vegetables, but junk food prices also are less likely to rise as a result of inflation. And although fruits and vegetables are rich in nutrients, they also contain relatively few calories. Foods with high energy density, meaning they pack the most calories per gram, included candy, pastries, baked goods, and snacks. The findings, reported in the Dec. 2007 issue of the Journal of the American Dietetic Association, may help explain why the highest rates of obesity are seen among people in lower-income groups. People don’t knowingly shop for calories per se, the data shows that it is easier for low-income people to sustain themselves on junk food rather than fruits and vegetables. And the problem compounds when you realize that it is easier to overeat on junk food because it tastes good and because eaters often must consume a greater volume in order to feel satisfied. Still, even those who consume twice as much in junk food calories are still spending far less than healthy eaters. If you only have a couple dollars to feed yourself, your choices gravitate toward foods which give you the most calories per dollar; not only are the empty calories cheaper, but the healthy foods are becoming more and more expensive. Vegetables and fruits are rapidly becoming luxury goods. This is why I thought that I would make an appeal for one of the greatest staples of the American diet. We as Americans love our salads. We have taken what has been a side dish around the world and created so many variations that a salad is now the standard at almost ever restaurant and dining room in America. I have recently rediscovered my love of salads and had forgotten how flexible they are. 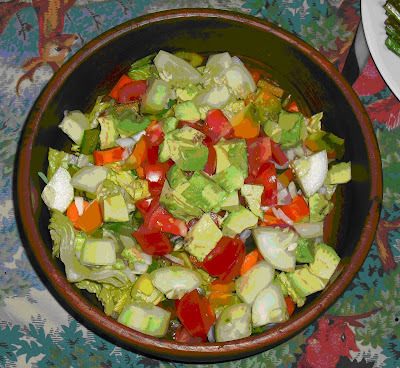 Each night we cut up any vegetables in the garden or fridge and dump them all into one bowl. This has led to what is generally known as our house Garbage Salad. The latest incarnation of our daily dinner salad is the Herb’s Salad. It is your basic Garbage Salad with whole herbs from the garden thrown in on top. It is amazing what full leaves of basil, oregano, thyme, cilantro, parsley, and beet leaves (very tasty) can add to the smell and flavor of the salad. Our salads are now at the point where they don’t need a dressing. Pictured below is the salad from last night. It is a combination of banana peppers, cucumber, tomato, red and orange peppers, whole basil leaves, red onions, cilantro leaves, white onions, oregano leaves, beat leaves, avocado, and two kinds of lettuce. The total effect is one of a large course with the meal. Moreover, a salad like this can be coupled with just about any amount of meat to make a complete meal. The best part of the salad pictured above is that its total price was $6.89 and fed five people (along with the main course of chicken). The reason it was so cheap is because a healthy portion of it was grown, in pots, on our back porch. The total cost of soil, pots, seeds or plants, and water is estimated at $21.55. Almost a hundred salads (or other sides, snacks, or ingredients to other items) can be harvested from that original investment. So as the cost of healthy foods increases, we need to learn to offset it while still maintaining a nourishing and wholesome diet. Supplementing expensive healthy food with something as versatile as a salad is not only a wise idea, it may be the best idea while still staying relatively cheap. Good food doesn’t need to be a treated as a luxury - no matter how good it may be. I love my son, but I fear for his life. This isn’t a rational fear, but its persistent, overwhelming, and it happens to all parents. You see, children are born with no fear what-so-ever. You save their lives hundreds of times a day, rearrange your life to keep them safe, and imagine an infinite number of ways in which harm can come to them. These thoughts can eventually metastasize into nervous idiosyncrasies that can easily manifest themselves and create overprotective parents. With me, the fear haunts my dreams. I do what I can to suppress it, but the fear has a way of sneaking through. Below is a dream that I had several nights ago. It’s horrific and I apologize ahead of time, but feel the need to share so that I will not have this dream again. I was cold and lifeless before he was, still in my thoughts and emotions, and silently accepting of the situation on some level deeper than I should have. I always assumed that he would die before me, things in my life just happened that way. He was my first son and the last of my hope. Hope for myself, nothing else. I had failed at everything in life and he was to be my salvation - proof that I was something. So as I looked down at his lifeless body, wondering how something so fragile could ever really have a chance, I knew that my own life had also just ended. It had started seven months before on my wife’s birthday as the best present possible in the worst possible wrapping. He was 8 pounds 4 ounces, 19 inches long, and was born at 9:57AM Eastern Standard Time. They took him immediately, fluid in his lungs, and he stayed in the hospital for almost a week. She stayed by him while I tried to keep the family and friends away. When he finally emerged from the hospital a week later, he was healthy and normal. His small body, dead and still perfect, lodged in my head as I crawled into the tub. She had left for her parents; family would heal her. I told myself that I would feel no pain, but I didn’t care. A friend who I trusted would find me in a couple hours and tell the story. Everyone would claim that they saw it coming and did nothing. Vague admissions to pardon my actions, but all meant to bolster the pain. I now wished the pain would come, but knew it wouldn’t. I was already dead. The months ahead of him were normal in every way. Fawning family, sycophantic friends, and random well-wishers - all stealing his time for their own. I was a good father and did everything that I could to make his time here perfect. For a while I thought that my life was renewed, like some sort of forgiveness of past sins. He learned to smile, roll over, and laugh all while looking at me. My confidence grew with each of his victories and I was a better person than I have ever been before. They took his body away immediately. Standard operating procedure when an infant is involved. You just can’t trust parents not to kill their children. This was no different. He was bagged, zipped, and carried out by someone who tried not to say anything. My wife sobbed and I stood there like an idiot. Arrangements were hastily made, she left shortly after, and we barely exchanged words. Both of us were dumb, but I remained motionless in her fury to keep moving. He had been learning how to stand - pulling himself up on anything or anyone within reach. Food was his latest hobby and he never failed to get most of it in his mouth. He smiled a lot and people told him that he was beautiful. He was, he knew it, and it showed. Confidence would have never been a problem for him. I’m sure that all parents think that their baby is above average, but I really believed it. My decision to kill myself had been automatic - I had no choice in the matter. I would always remember his smile and the cold way that it distorted once I realized that he was dead. It would haunt me until I died, so there was no use in prolonging the inevitable. I waited for her to leave, took several more phone calls, and made sure that someone was coming to check on me. Business as usual, just punching the clock and doing my job. It was the stereotypical morning that you always hear about. Movement, shuffling, and quiet sounds emanated from his crib. I rose to catch him before he could get grumpy, but this time it was different. The sounds had come from my head, during their usual time, and I had got up in expectation of a smile and our practiced morning. Later they would call it Sudden Infant Death Syndrome - I knew that you wanted something sexier, but life doesn’t work that way. He died by himself, hours before me, and was a better person. I would like to tell you that I looked as beautiful as I lay in the tub, that my smile equaled his, and that I would be missed as much, but I know better. He was the best of me and I was just finishing what he had started. With all the current political happenings, we now have daily examples of people switching from the Republican candidate to the Democratic candidate because “Obama represents a sliver of hope. McCain represents none at all” (Bacevich, The American Conservative). Over the last several days Christopher Buckley, writer and son of the famed National Review conservative William F. Buckley, announced that, “for the first time in my life, I’ll be pulling the Democratic lever in November” (thedailybeast.com). While the heavy-hitting conservative Wick Allison, editor-in-chief of D Magazine, said, "My party has slipped its moorings. It’s time for a true pragmatist to lead the country” adding “Barack Obama strikes a chord with me like no political figure since Ronald Reagan” (dmagazine.com). So yes, you can be a Republican and vote for a Democrat. This is especially true when one side is represented by “a Great Communicator in the mold of Reagan, John F. Kennedy and Franklin D. Roosevelt, a leader who can inspire Americans to work together on the problems of the 21st Century” (Jeffrey Hart, former Nixon and Reagan speech writer, rebublicansforobama.com) and the other is, according Bill Kristol, founder and editor of the political magazine The Weekly Standard and regular commentator on the Fox News Channel, running "a pathetic campaign" (youtube.com). Or, to paraphrase Douglas W. Kmiec, Caruso Family Chair and Professor of Constitutional Law at Pepperdine University, who served as head of the Office of Legal Counsel (U.S. Assistant Attorney General) for Presidents Ronald Reagan and George H.W. Bush, sometimes you just have to switch parties to vote for the better candidate (slate.com). But why? Why would a red-blooded conservative living in the US of A want to vote for Obama? Well, don’t do it because David Brooks, conservative columnist and pundit, formerly of National Review, called Sarah Palin a "fatal cancer” (nationalreview.com) or that Joshua Trevino, co-founder of RedState, said, "Do I believe in John McCain? Not as much as I used to. Do I believe in Sarah Palin? Despite my early enthusiasm for her, now not at all. Do I believe in the national Republican Party? Not in the slightest -- even though I see no meaningful alternative to it” (joshuatrevino.com), and don’t vote for Obama because people like David Friedman, the son of late conservative icon and Nobel economist Milton Friedman, have endorsed him (davidfriedman.blogspot.com), or even because Christopher Hitchens says to vote for Obama because “McCain lacks the character and temperament to be president. And Palin is simply a disgrace” (slate.com). Don’t even vote for Obama because Andrew Sullivan, author of The Conservative Soul, says that Obama “could transcend” (theatlantic.com) our problems, or because Frances Fukuyama, one of the key founders of the Reagan Doctrine, agree that "Obama is the only one of the candidates who can escape the polarization" (smh.com.au) and find real solutions. And don’t vote for Obama because Larry Hunter, supply-side economist who helped is credited with writing the Republicans' 1994 Contract With America, said "I am enthusiastically supporting Barack Obama for president" (thedailynews.com). Instead, vote for Obama because in your heart, you know he’s right. Bacevich, A. (2008) The Right Choice? : The conservative case for Barack Obama. The American Conservative. March 24, 2008. At a recent rally in Lakeville, Minnesota, John McCain was openly booed for suggesting that Barack Obama is a “decent person and a person that you do not have to be scared of as president of the United States”. Along with boos came the ferocious anger of many in the crowd. “Traitor,” “terrorist,” “treason,” “liar,” and “off with his head” all shot back at McCain, triggered by his outlandish suggestion that his opponent is a decent person. This recent attempt to calm down a raucous rally comes after a week in which Sarah Palin suggested that Obama had been “palling around with terrorists” and the campaign’s political operatives and supporters have been encouraged to increase the hard line attacks. Both McCain and Palin have gone to great lengths lately to paint their opponent as someone who will lead the country into Socialism, and they have been encouraging their supporters to take the election personally by using inflammatory words from the stage. This latest outburst from one of the Republican candidate’s crowds is the second time in which someone has called for the death of the Democratic candidate. And this is hardly surprising considering that both McCain and Palin have spent the last couple of weeks fanning the flames of hatred and bigotry towards Obama. And when John Lewis, the civil rights leader who became nationally known after his prominent role on the Selma to Montgomery marches, when police beat the nonviolently marching Lewis mercilessly in public, leaving head wounds that are still visible today and who is now the senator from Georgia’s 5th district, released a statement this Saturday that McCain and running mate Sarah Palin were “sowing the seeds of hatred and division, and there is no need for this hostility in our political discourse” he too was echoing a growing major concern of many Americans. So with November 4th quickly approaching and John McCain’s campaign still losing ground to Barack Obama, we can expect that the Republican campaign will do everything possible to attempt to paint their adversary as unfit to lead. Whether or not that language is laced with not-to-subtle hate speech, comparing him to our enemies, and building him up as a scary black man, has yet to be decided. But one thing is still certain: if their campaigns continue with their current level of inflammatory words, you can expect that our first black president may not be our president for very long. This last Sunday 33 Evangelical pastors defied a federal law that prohibits U.S. clergy from endorsing political candidates from the pulpit. The Rev. Ron Johnson Jr. told worshipers that the Barack Obama’s positions on abortion and gay partnerships are "in direct opposition to God's truth as He has revealed it in the Scriptures." The Reverend believes that he as has a constitutional right to advise his congregation how to vote. In between sermons the he told the Washington Post, "The point that the IRS says you can't do it, I'm saying you're wrong." Almost ever election there are members of the extreme religious right who come out in defiance of the code that says nonprofit, tax-exempt entities may not "participate in, or intervene in . . . any political campaign on behalf of any candidate for public office". I don’t understand why a religious person in a position of power would exchange their historic religious authority for a fleeting promise of political power, to the detriment of their churches. Moreover, by entering into a relationship between the state, they are sacrificing the direction of their faith to a government organization. Anytime a private sector is institutionalized, the government gets to control the direction of the newly acquired entity. So our system is set up to protect religions from being turned into government organizations. This keeps them free to choose their own direction, beliefs, and faith. The payment for this is that they must stay free and clear from "participate in, or intervene in . . . any political campaign on behalf of any candidate for public office" (1954 tax code amendment). What bothers me more about this situation is that there are people in this country so willing to give the government power over the direction of their most sacred beliefs. Sure I’m post-theological, not religions, atheist, or whatever you want to label me, but the mere fact that we have American citizens so uneducated in their government that they would willingly give up their freedoms is extraordinarily disturbing to me. I don’t know of anyone who would be so enthusiastically accepting of the government telling them how to speak in their own home, instructing them what to watch on TV, or how to vote. Yet, these same people would seem elated to mix their deepest held beliefs with a government who would only seek to use that faith to their own means. It is a frighteningly moronic and almost not worth our time to protect their faith, but I know that my own freedom of belief is the same as theirs. These 33 ultra-right wing Evangelical pastors threatened all of our freedoms with their actions. And that is something for which I cannot stand.